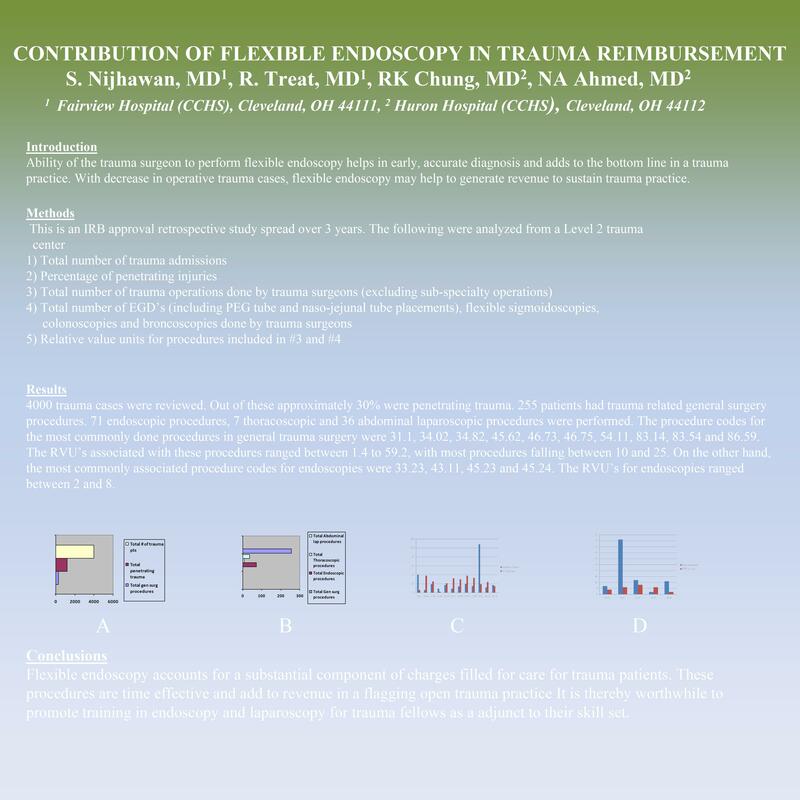 The ability of a trauma surgeon to perform flexible endoscopy helps in early and accurate diagnosis of various acute injuries and adds to the bottom line in a predominantly trauma practice. With decrease in operative trauma cases, flexible endoscopy may help to generate enough revenue to sustain trauma practice. 4000 trauma cases were reviewed. Out of these approximately 30 % were penetrating trauma. 255 patients had trauma related general surgery procedures. 71 endoscopic procedures, 7 thoracoscopic and 36 abdominal laparoscopic procedures were performed. The procedure codes for the most commonly done procedures in general trauma surgery were 31.1, 34.02, 34.82, 45.62, 46.73, 46.75, 54.11, 83.14, 83.54 and 86.59. The RVU’s associated with these procedures ranged between 1.4 to 59.2, with most procedures falling between 10 and 25. On the other hand, the most commonly associated procedure codes for endoscopies were 33.23, 43.11, 45.23 and 45.24. The RVU’s for endoscopies ranged between 2 and 8. Flexible endoscopy accounts for a substantial component of charges filled for care for trauma patients. These procedures are routine and easily performed in a short amount of time. Multiple procedures may be done in a regular work day. As a part of trauma surgeon’s armamentarium, they provide for continuity of care. It is thereby worthwhile to promote training in flexible endoscopy and laparoscopy for trauma fellows as an adjunct to their skillset.